Of the two, the latter is the most likely to elicit not only an emotional response from viewers, but also move them to a specific action and, hopefully, change their way of seeing the world. While some may be hesitant to appear too mushy to viewers­­especially in B2B marketing­­it has actually been proven time and again that emotions are what drive all types of consumers to make buying decisions. After all, purchases are actually personal decisions based not only on logic, but the feeling that you’re making the right choice. Just take a look at the diagram above. 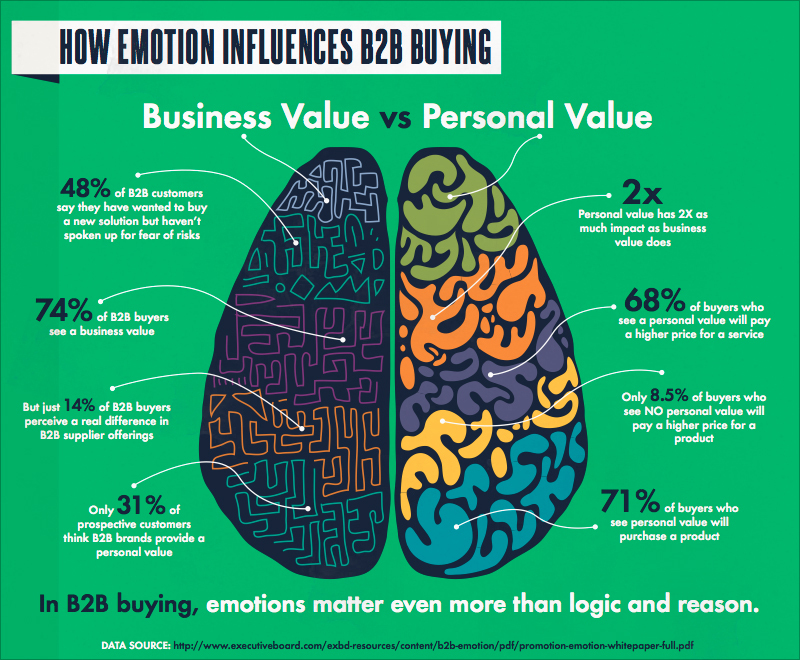 It shows that personal value has twice as much impact on B2B buying as business value does. For example, in order to influence B2B buyers, you can evoke a common feeling such as fear by making them aware of what they’re missing out on. In essence, what makes a video popular has to do not only with the way it makes people feel, but also the way it makes them look in front of others. 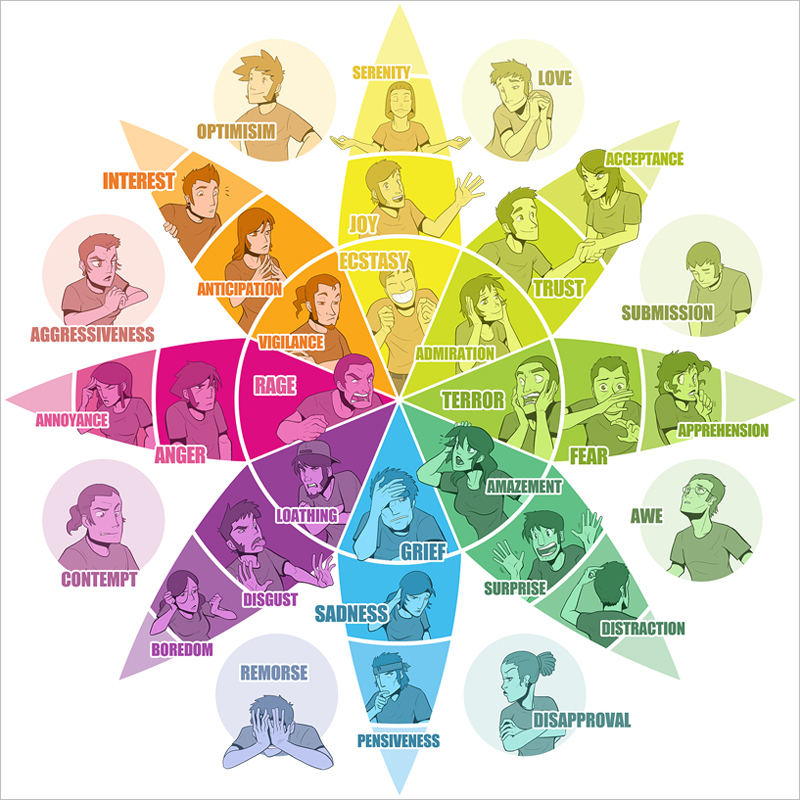 In this post, we will focus on achieving the first part, which is how to tap into the right emotions so that your audience feels naturally inclined to promote your brand to others. The first step to creating an effective video that achieves the intended effect is to determine which emotions you want to tap into first. 2. Find a compelling story to tell. The next step to creating an effective video that will move audiences to a specific action is to craft a compelling story, which starts with an awesome script. The best way to provide a memorable experience is to create an emotional roller coaster ride for the viewer by creating suspense, the desire to know what comes next and throwing in a couple of surprises here and there. It is also important to incorporate down moments in which the audience can take a breather and regroup, In the end, you’ll have a video full of ups and downs that is emotionally satisfying, narratively cohesive, builds up to a specific message, and serves a purpose. Another important element in video production is finding the right people to execute your script. You might have a great story on your hands with awesome potential, but if the actors aren’t credible, then it will all go to waste. One way to ensure this doesn’t happen is to carefully review the actors’ portfolio to determine if the right emotions were elicited by their past work. A very important but often overlooked element is the music you choose­­whether background or foreground music. A study conducted by the University of London found that the music that accompanied visual elements had a noticeable impact on the interpretations reached by the participants and elicited a variety of emotional responses. This means that the music you choose has a huge effect on the overall impression your video will have on your audience. When it comes to the best movies, there’s the Oscars. When it comes to B2B video marketing, there’s actually something called the B2B Oscars, which is organized by the company OpenView Labs. 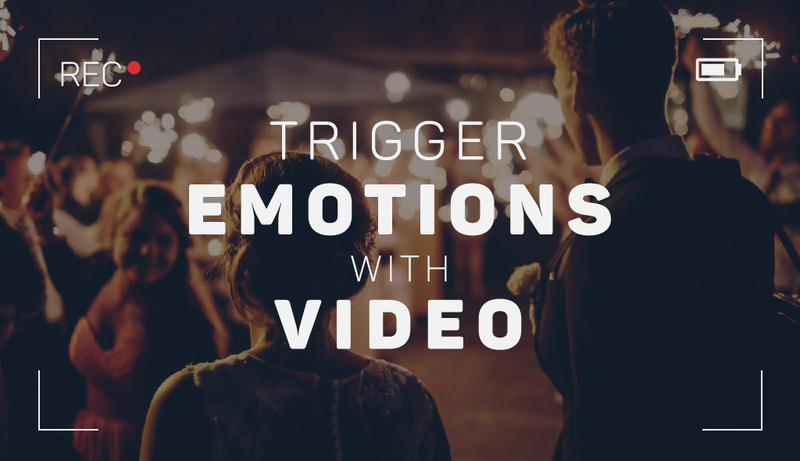 To get a better idea of what makes an effective video that taps into all the right emotions, we hand­picked a few of last year’s winners to demonstrate how each of the emotions mentioned above can be triggered when all the right elements are combined. The video above created by the company Sandwich Video illustrates how making people laugh is always a surefire way of getting into people’s hearts and minds as a memorable brand. The quirky characters and the creative use of animation actually make this testimonial video a pleasant watch­­not like many of the cheesy corporate videos out there. In the end, the viewer has been unwittingly informed of the impressive results achieved by the brand in a very down-­to-­earth and unpretentious fashion. Video is not only one of the most powerful tools for reaching potential customers, it is also a perfect way to show potential recruits what makes your company one of the best places to work. 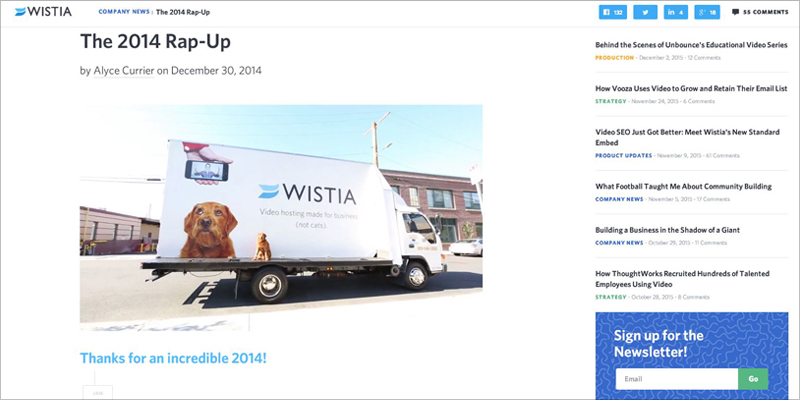 In the example above, Wistia does an excellent job of showcasing a unique organizational culture full of positive energy and creative talent. One of the ways to create suspense, mentioned above as an essential ingredient in any story, is to evoke curiosity in the audience. BambooHR, for example, does an excellent job of creating that desire to know what happens next, leading the audience to take that crucial step of visiting the company’s landing page. This Adobe ad is another example of a perfectly executed video. It uses humor and a real­-life situation to subtly create a sense of uncertainty in viewers. By asking “do you know what your marketing is doing?” the spot effectively taps into the audience’s need to better control their circumstances (in this case, their marketing efforts) so as to avoid getting caught up in a wild-­goose chase. This TV spot by Zendesk is both highly amusing and informative. By comparing customer service to a marital relationship, it not only makes viewers smile, it also highlights some very common failings in the way businesses interact with their customers. In its choice of a cute, elderly couple, it also creates feelings of warmth and familiarity, which are then associated with the brand. In the long run, this clever tactic has the potential to convert the Zendesk name into a top­-of-­mind brand. Catering to the need to feel better about themselves, this TV ad is an example of a video that promises viewers a way to differentiate themselves from the rest. By resorting to an effective technique of personifying an abstract concept­ in this case, portraying the web as a motley crowd of circus freaks ­ this spot effectively creates the desire to rise above the Internet hype. As noted previously, your choice of music can either make or break your video. Just take a look at the example above. The foreground music instantly creates a sense of awe and wonder­ the kind that would be associated with traveling to space and exploring unknown worlds. It’s also important to note that the unexpected pauses and notes hit by the music also provide a slight feeling of surprise and an element of suspense. What about your videos? Are they tapping into the right emotions and leading viewers to a desired action? We would love to hear your reactions and thoughts in the comments section below. A case study we did on Miva Inc., which saw an increase in memberships and subscribers by using the Uscreen video on demand platform.